The full set of annotations can be written out to an HTML report for closer inspection. To enable the creation of these (potentially voluminous) HTML reports, add "htmlAnnotations" : true to your graph builder JSON configuration. If the graph is saved to a file, these annotations are saved with it and can be examined later. Currently the only tool for doing this is the "Graph Visualizer", which is not particularly well maintained and is intended for use by software developers familiar with OTP who can patch up the code as needed. OpenTripplanner has option to ease debugging problems with graph. Older option is graph visualizer. Which you can enable with --visualize parameter instead of --server when starting OTP. There you can see whole graph. You can click on edges and vertices and see the metadata. It is useful to see if street has expected options. And if connections are where they are expected. It can be hard to use on large graphs since, whole graph is displayed at once. And it can be hard to search for specific streets since only street graph is shown without the rest of information. Traversal permissions (colors street edges based on what types of transit modes are allowed to travel on them (Pedestrian, cycling, car are currently supported)) Traversal permissions layer also draws links from transit stops/bike rentals and P+R to graph. And also draws transit stops, bike rentals and P+R vertices with different color. 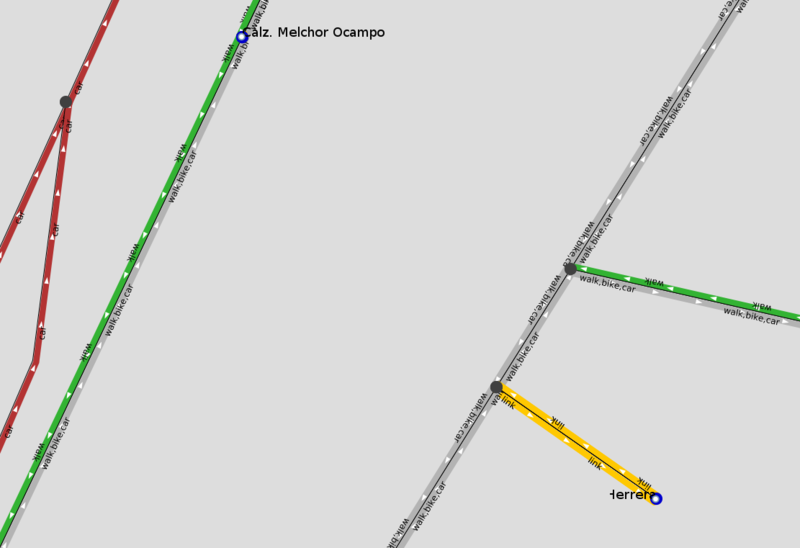 A sample traversal permissions layer looks like the following Yellow lines is the link between a stop and the street graph. Grey lines are streets one can travel with the mode walk, bike, or car Green lines are paths one can travel with the mode walk only Red lines are streets one can travel with the mode car only * Grey dots vertices where edges are connected. If two edges are crossing w/o a vertice at the intersection point, users will not be able to go from one street to the other. But this can be valid in case of over/under pass for example. If it's an error, it's usually caused by improperly connected OSM data (a shared OSM node is required). Access tags (such as bicycle/foot = yes/no/designated) can be used to override default graph-building parameters. As a default, foot and bicycle traffic is ''not'' allowed on highway=trunk, highway=trunk_link, highway=motorway, highway=motorway_link, or highway=construction. Both are allowed on highway=pedestrian, highway=cycleway, and highway=footway. Finally, bicycles are notallowed on highway=footway when any of the following tags appear on a footway: footway=sidewalk, public_transport=platform, or railway=platform. Other access tags (such as access=no and access=private affect routing as well, and can be overridden similarly. While access=no prohibits all traffic, access=private disallows through traffic. OTP users in Helsinki have documented their best practices for coding railway platforms in OpenStreetMap. These guidelines are available in the OSM Wiki.